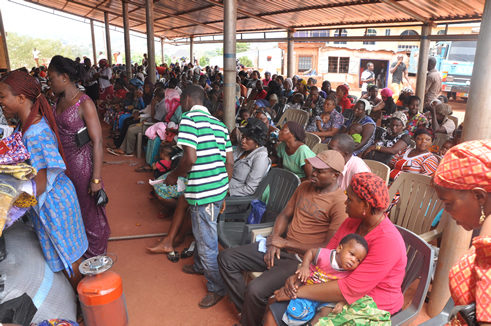 Meanwhile, on the 26th March 2015, over 1,000 South East returnees from Northern State converged at Christ the King Parish, GRA Enugu, following Fr. Mbaka’s invitation to them to share their plight. The invitation which the Spiritual Director of Adoration Ministry thought will have very few people in attendance turned out to witness a mammoth crowd of returnees that filled the parish church compound as at 10 am. At the gathering, some of the returnees from Maiduguri, Kaduna, Jos, Abuja, Kano, etc shared their ordeals. Mrs Florence Ede, a mother of five, recounted how he relocated to Enugu from Kaduna State with no body caring whether she and her children are dead or alive, she said that she made attempts to seek the help of the government and was chased out from the government house with a gun. Ozo Helen, whose husband was as successful patent medical dealer in Zaria, recounted how her husband became a truck pusher upon their return after the burning of their shop in Zaria. The most pathetic was that of Juliana Igwe who lost his husband and child in the last year’s Jos bomb explosion. Martin Ozo who returned from Kaduna after recounting his story regretted the systematic disenfranchisement meted out to them as internally displaced persons. According to him, they collected their Permanent Voter’s Registration in the North but there is no arrangement by the government or INEC to ensure that they cast their votes now that they had to run to the East for their lives. Others who shared their ordeals at the events included Rosmary Elobike, Christian Chime, Chinenye Ugwu, and Rebecca Okaria among others. Rev. Fr. Mbaka later addressed a crowd of the returnees. He told them that the essence of his invitation to them was first to welcome them back home, secondly to find out how they are faring and lastly to console them in their conditions by letting them know that their situations shall end with a testimony. In his address that lasted for about an hour he gave them psychological succor and comfort in their situation. Each of the returnees went home with bags of rice and clothes and some other food and gift items some of which were contributed by members of Adoration Ministry Enugu Nigeria, Following Fr. Mbaka’s appeal to them. God is very wonderful. Glory be to God forever and ever for there is other God besides Him. Long Life to Adoration Ministry, and Long Life to Rev. Fr. Ejike Mbaka. Peace and Love of God be with you.